We know many ways we can use PC to watch some TV programs especially some TV news. I like watch news channels including CNN, NBC, BBC but I can use TV to watch this news programs. 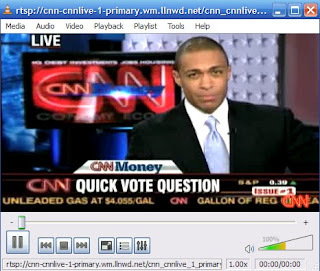 I know many people especially who live in outside US want watch CNN, and we have some ways to use computer to watch CNN, but if you try other way can not watch it, maybe you can try this way. It is simple, just copy this address below and paste into Windows Media Player address bar, click play button that is all.